The doors have not officially opened at Frisco’s new Independence High School, but the IHS Royal’s Varsity drill team trophy case is already filling up! At competitions organized by Crowd Pleasers from June 12 – 15, drill team Officer Camp and Line Camp involved leadership training, bonding activities, choreography, and dance classes. Independence High School is in east Frisco, at 10555 Independence Parkway and it serves the surrounding neighborhoods south of Eldorado, including several neighborhoods in west McKinney. This is a brand new school (not even open yet) with a brand new team. The dancers are coming from all different schools (re-zoned), and are together for the first time as a large group. Sheryl Ambers, formerly worked at NBC Nightly News, has been living in North Texas for over 20 years, and is a practicing speech-language pathologist. 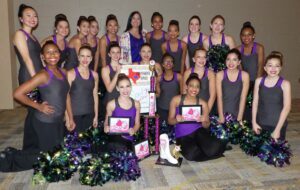 Her daughter is an IHS Royals dancer, and Ambers is proud to share the accomplishments of this new team.